Here at Aspire we're always on the lookout for top talent to join our quickly growing company. With a growing number of exciting projects in the works, our creative team has immediate openings as they expand to design more cutting edge brand campaigns, innovative websites for early-stage companies, and other creative content to help our ventures reach consumers and investors. If you're a design wiz or gifted web developer, read on. 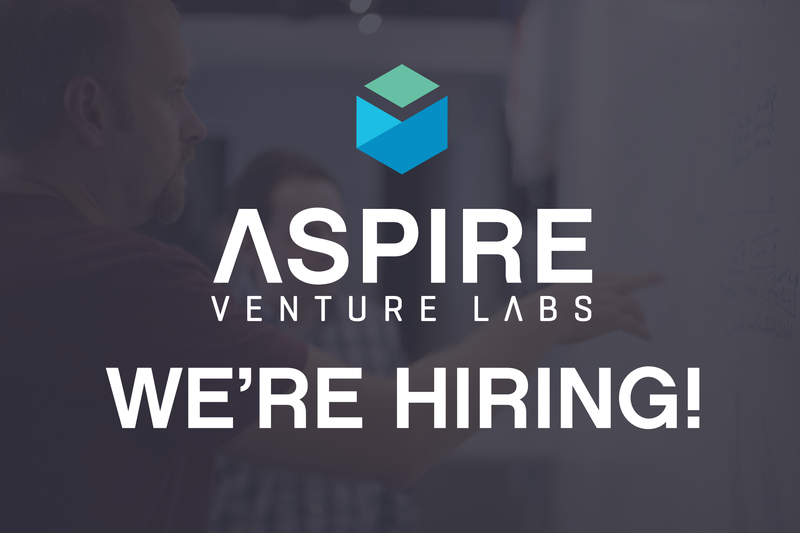 Serious inquiries may email careers@aspirevc.com or speak with our HR Administrator Renee Rahe at 717-925-8453. Aspire Ventures, an Aspire Universal company, is a growing venture capital firm headquartered in Lancaster, PA, that incubates tech startups and develops cutting edge technologies with a global reach. The Aspire creative team is looking for an experienced Front-End Web Developer/Graphic Designer to design and produce front-end web content for Aspire's various startups and projects. Work and grow with an energetic, diverse team of graphic designers, motion graphic artists, marketing strategists, and copywriters in a fast-paced environment that never gets routine or boring. The Developer/Designer will assist the creative team to develop an impactful web presence as well as a creative vision for early stage companies and products. At the Aspire Venture lab, team members work in a collaborative, stimulating atmosphere where they can thrive to meet their fullest potential. Aspire offers competitive salaries and generous benefits packages that include health and retirement benefits, a very flexible vacation policy, and incentives that give employees a vested interest in each venture's success. Aspire Ventures, an Aspire Universal company, is a growing venture capital firm headquartered in Lancaster, PA, that incubates tech startups and develops cutting edge technologies with a global reach. The Aspire creative team is looking for an experienced Lead Production Artist to assume team design and brand leadership while producing a wide variety of art production assets for Aspire's various startups and projects. Work and grow with an energetic, diverse team of graphic designers, motion graphic artists, marketing strategists, and copywriters in a fast-paced environment that never gets routine or boring. The Lead Production Artist will direct team design choices in establishing future Aspire brands and developing brand image for early stage companies and products as they move to maturity. Work closely with Aspire's Creative Team Manager, Marketing Director, and EIR's to understand project goals, scope, constraints, and motive. Assist in the process of hiring capable Creative Team employees to fulfill key production roles. Ability to learn and apply new design software in order to achieve project goals. Aspire Ventures, an Aspire Universal company, is a growing venture capital firm headquartered in Lancaster, PA, that incubates tech startups and develops cutting edge technologies with a global reach. The Aspire creative team is looking for an experienced Production Artist to produce a wide variety of art production assets for Aspire's various startups and projects. Work and grow with an energetic, diverse team of graphic designers, motion graphic artists, marketing strategists, and copywriters in a fast-paced environment that never gets routine or boring. The Production Artist will assist the creative team in shaping brand image by producing visual assets for early stage companies and products. Work closely with Aspire's Creative Team Manager, Lead Production Artist, Marketing Director, and EIR's to understand project goals, scope, constraints, and motive. Experience in maintaining objectives across quickly evolving projects.